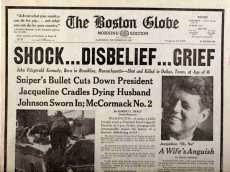 It was about 12:30 p.m. on this day in 1963 that President John F. Kennedy was fatally shot while riding in a motorcade in Dallas, Texas. 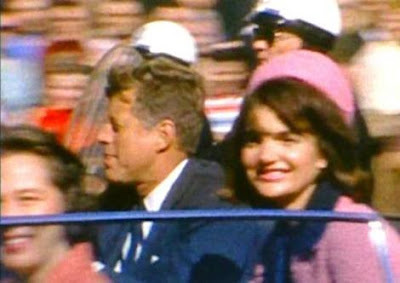 It was the only successful assassination of an American president carried out in the last hundred years, and the only presidential assassination ever caught on film. Almost every American alive at the time remembers where they were when they heard the news. I was a teenager,19, when it happened; and like most, I remember exactly where I was, and what I was doing. I had been working for the telephone company, it was getting close to Christmas and the union had called a strike. My Dad, Mom and I were all union members and were on strike. I had gone to Sears, thinking some Christmas pocket money would be nice, and turned in an application. I was called back and interviewed and on 11/22/ 1963 at 10:30 a.m., I was at Sears in Long Beach taking a test, as part of the process for gaining employment. The test takers were in a room seated at tables, we'd been there about 1/2 an hour, when the woman in charge of giving the test came in and said: "I really don't know what to do, but I thought I'd better tell you, the President's been shot". I didn't believe her, "people don't shoot the President of the United States, in these modern times," is what I was thinking. I was also thinking, "this is part of the test, to see how we'll re-act." I finished my test and left the room, and found out it was true. It was a horrid day, and if you were over 10 years old that day, I know you remember where you were and what you were doing. This is truly how Americans felt on this date. I also remember the exact place and time. I was 20 and in school as an x-ray technologist. A patient I was x-raying told me about the shooting, and I remember thinking he was telling me a cruel joke. It's amazing how when you think back on that day how clear it all becomes. I graduated from high school that year and was living at the "Y" in Orlando Florida. I came home from work and all the girls were gathered around the tv watching. I remember my teacher crying when we came into his classroom ... and I'd never seen a grown man cry before. I wasn't alive, so I don't remember, but I can imagine how you would. I was 15 when Reagan was shot and remember that in detail. I can imagine how much more that would be in one's mind in a different era and when he was actually killed.